Happy Thursday everyone! Yes, I know that it is odd to see a post from me today but I have to make up for my lack of one yesterday. I apologize for the delay – I was preoccupied with doctor visits and as much as I wanted to talk about the delicious dish you see above, I just didn’t have the time. Excuses, excuses. But this morning, I do. And as I am hopped up on ample cups of caffeine – thank goodness coffee is sodium free – I’m ready to dig into the long-awaited recipe for sunchoke hash. Before I go into the dirty details, I must first answer the question I know you’re asking: what exactly does a sunchoke look like? This bulbous bundle of joy looks like a more rotund version of ginger and sometimes has beautiful purple hues towards the tips, like a sunchoke sunset. As I’ve explained in previous posts, sunchokes can be hard to find at your typical grocery store, but they are suddenly popping up at Farmers Markets. Tis the season indeed. And if you are a San Fran local, I have been grabbing mine at the Noe Valley Market on Saturdays. 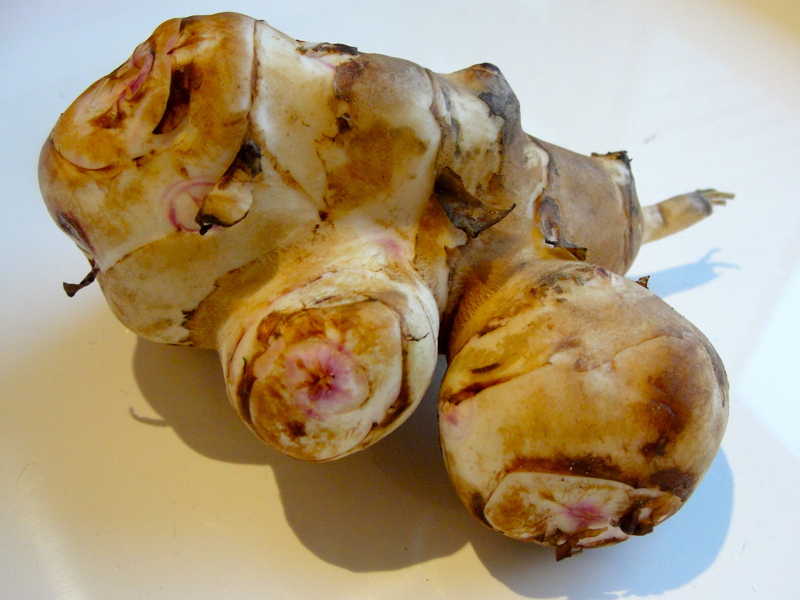 Sunchokes are slightly expensive – upwards of $5 a pound – but you don’t need to spend too many bucks for a lot of bang. Just one bulb can stretch quite a ways, especially when you pair it with more mild ingredients like cauliflower and potatoes. 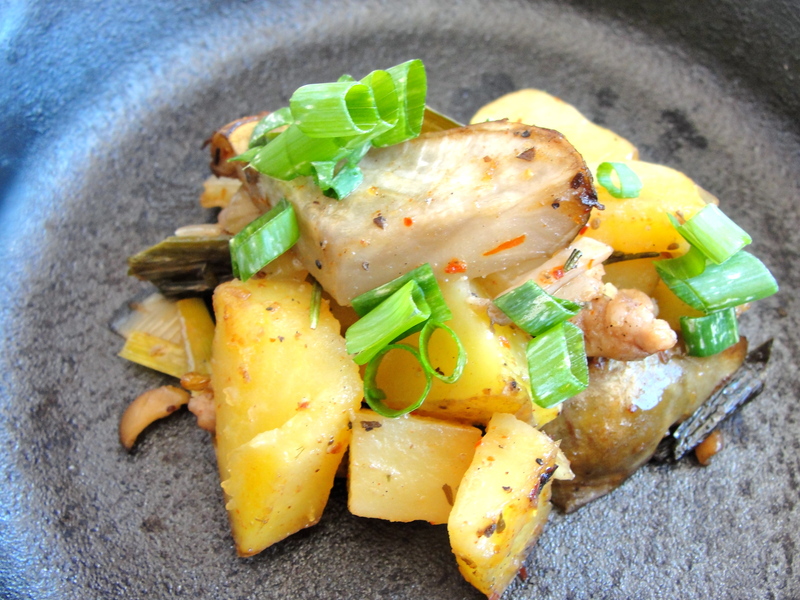 Which brings me to the dish of the day: a sunchoke and potato hash. To make, I simply chopped three yukon gold spuds into small cubes and then diced two sunchokes into slightly smaller chunks. After seasoning with white pepper, onion powder, olive oil, and a little paprika, I filled eight ramekins and popped them in the oven to sizzle. After an hour at 400 degrees, the potatoes were soft and the sunchokes were silky. I dressed each ramekin with some green onions and a few red chili pepper flakes, and even with these additions, the artichoke flavor still prevailed. With an ingredient like the sunchoke, it is easy to create complex flavors without much work – an accomplishment worth the price tag. And it is a great reminder that if you use the right product, the right technique, or the right pairing, your food can jump off the plate without salt, or really any seasoning at all. Whole food is good food. This weekend, wake up that traditional Sunday breakfast and treat yourself to a decadent hash with the help from sunchokes, or maybe just a drizzle of truffle oil, and dig into something filling and flavorful. As I am off to my 5th year college reunion (where did the time go and where can I buy a time machine), I will not be seeing you until next Monday, but I promise pictures and stories of banana mini muffins and maybe some other fall treat. It is sure to be another memorable baking adventure. Failure or success. Be creative, be full, and as always, chow on. Oh you sneaky thing, I knew you’d do something with those golden potatoes. 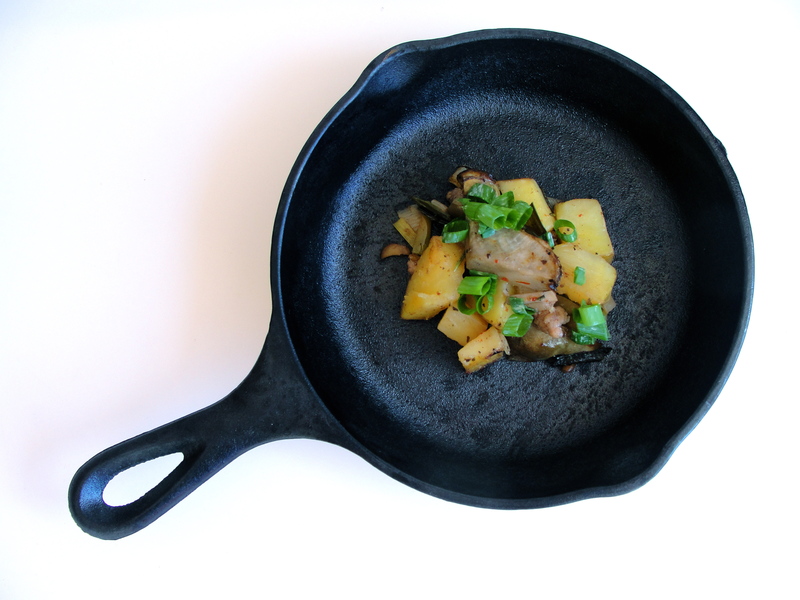 The hash sounds delicious, but how do you prepare the sunchoke? I’ve never eaten one (I don’t think) and certainly have never cooked one. Do you peel it like ginger? Anyway, enjoy your reunion! Hope it’s a blast.